In the critical world, it's not exactly high praise to say Wonder Woman is Warner Bros. and DC's best film in the recent line-up, given the poor reactions to both Batman v. Superman and Suicide Squad. So to get the obvious out of the way first: yes, Wonder Woman is the best of the three, by far. DC's best bet for this film was to stick to a simpler, more logical story and focus on developing Diana's character, and it readily met both of those goals, crafting one of the best on-screen superheroes in years. Whether it's a great film? I'd say: close. Wonder Woman has amazing character development and my hands-down favorite action scene in any superhero movie during a second act piece where Diana inserts herself into the front lines of the war. But, like so many superhero films before it, Wonder Woman stumbles in the third act, where it reverts to a CGI-laden showdown with a big bad we can barely see or understand, bumping the overall feeling of the film down a notch. Opening with a framing device that calls back to BvS, Wonder Woman is an origin story set during World War I. 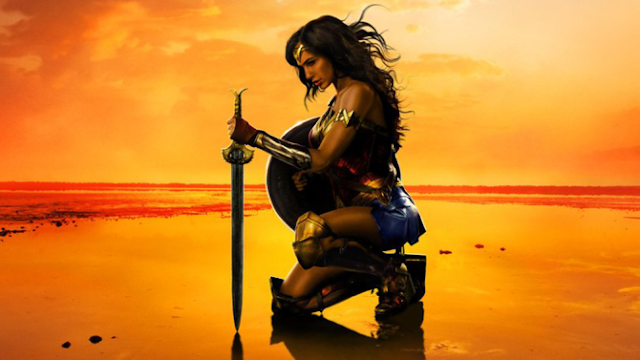 At the start of the film, Diana (Gal Gadot) lives with the Amazons on Themyscira in peace, largely oblivious to mankind, but bracing for the god of war, Ares, to bring chaos into their lives. When Steve Trevor (Chris Pine) crash lands on the island while escaping from German soldiers, Diana learns about humanity and the ongoing war happening across the world. Certain the war marks Ares' return to Earth, Diana decides to leave Themyscira and bring the god of war to an end. While Diana's backstory isn't the same, the plot beats and strengths of Wonder Woman remind me of Captain America: The First Avenger. Gadot and Pine have amazing chemistry and banter, and I loved every bit of the film that featured them working together to leave Themyscira, visit London, and fight through enemy lines. In these first two acts, the movie managed to deliver intense action sequences and easily moved between serious and lighter fish-out-of-water moments. Lucy Davis was also perfect as Etta Candy. Days later, I'm still thinking about one of the action sequences in this film's second act, where Wonder Woman climbs above the trenches and pushes through enemy lines. If you see this movie for no other reason, see it for this one. The entire crowd was cheering, and the action looked great, even managing to incorporate the guitar-riffy Woman Woman theme from BvS in a way that felt natural in this movie. What's most impressive about this sequence is the way Diana uses defense as a strength: her shield draws away fire, and then she goes on to rip apart weapons rather than people. Unfortunately, as the film trudges into the third act, the stakes get higher and the battle between super-powered characters falls flat, recalling some of the messier CGI action with Darkseid in BvS. If you had issues with some of the violence in BvS, this third act will also likely leave you disappointed. I think Wonder Woman is a huge step in the right direction for DC's new slate of movies. Patty Jenkins' directorial efforts really shine through, and though the script's broad arc had problems, Diana's character development was top notch. If you came out of Batman v. Superman feeling like Wonder Woman was the best part, you'll likely love this film, but it hasn't managed to cure DC of its messy third act woes.